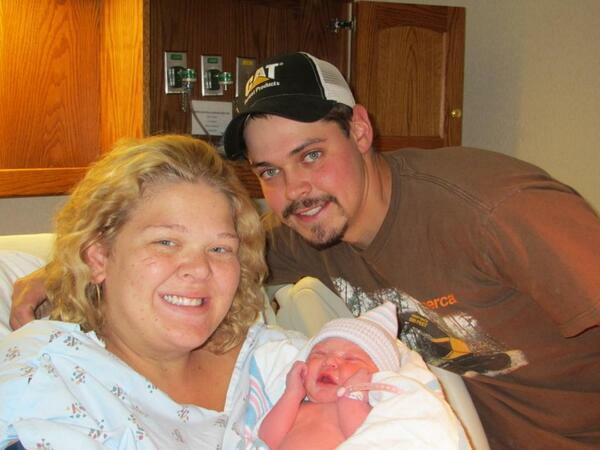 16 & Pregnant alumna Lori Wickelhaus and her new fiance, Joey Amos, welcomed baby Rylynn Jo Amos on Tuesday, Oct. 22. The Ashley’s Reality Roundup reported baby Rylynn weighed 6 lbs., 15 ounces and measured 19 inches long. When Lori’s first pregnancy was documented on 16 & Pregnant, the overarching theme was whether she would choose adoption or parenting for the baby. At the behest of her parents, she ultimately selected an open adoption. After that experience, Lori largely withdrew from social media and declined to appear on MTV’s follow-up 16 & Pregnant: Adoption Special. She also enrolled in a wilderness-based therapy program in West Virginia, which required Lori how to manage money, do chores, work, cook and pursue an education. She is now taking college classes and was working at a nearby nursing home until the latter part of her pregnancy. Now that she’s taking a bit of a maternity break, it certainly helps that Joey has a stable job at a local logging company.